When Cora Seaborne's brilliant, domineering husband dies, she steps into her new life as a widow with as much relief as sadness: her marriage was not a happy one. Wed at nineteen, this woman of exceptional intelligence and curiosity was ill-suited for the role of society wife. Seeking refuge in fresh air and open space in the wake of the funeral, Cora leaves London for a visit to coastal Essex, accompanied by her inquisitive and obsessive eleven-year old son, Francis, and the boy's nanny, Martha, her fiercely protective friend. These seeming opposites who agree on nothing soon find themselves inexorably drawn together and torn apart--an intense relationship that will change both of their lives in ways entirely unexpected. 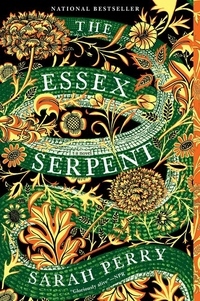 Hailed by Sarah Waters as "a work of great intelligence and charm, by a hugely talented author," The Essex Serpent is "irresistible . . . you can feel the influences of Mary Shelley, Bram Stoker, Wilkie Collins, Charles Dickens, and Hilary Mantel channeled by Perry in some sort of Victorian séance. This is the best new novel I've read in years" (Daily Telegraph).